ATC is on channel #11 NASM in Gridtalkie (GT) and it is not automated. Make a call in GT as you exit the pipes and if no ATC officer is on duty follow the routes above. If ATC is on we will guide you in. Fixed wing NASM NAVY landing, taxi and take off protocol. Main landing is on 18 L (1), main take off is 36 L (2), 36 R (1) is secondary take off when clear by ATC. 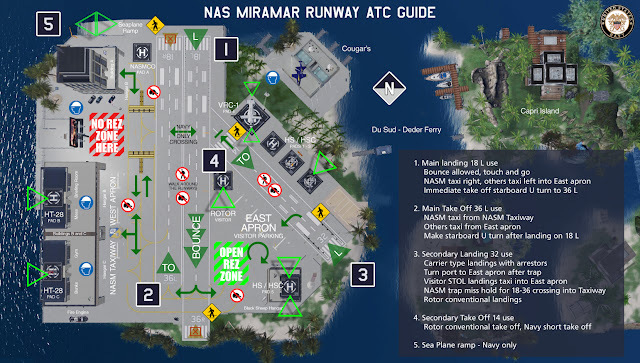 NAS Miramar pilots will take the taxiway by Hangars B and C after landing and stay on the West lot, hangars or tarmac. US Navy pilots are authorized to use the taxiway as lot as long as they stay with their aicraft. If moving away from the aircraft, take it to inventory or, for short stops, use the East apron by the Black Sheep hangar. Landing on 18 R (2 North) is only possible with ATC authorization. Large aircraft always use the East Apron. Take off from 18 L (1) is reserved for Bouncing (Carrier Field Landing Practice). No other take offs are allowed from it. Landing on 32 (3) is reserved for small carrier aircraft (arrestors present). 14-32 (4-3) is a STOL runway. Aircraft that make the trap should leave it turning immediately to port into the East apron, between Pad #07 and the Black Sheep hangar. Rotary wing NASM NAVY landing, taxi and take off protocol. All NASM rotary wing squadrons have assigned pads. HS-4, HSC-13 and HSC-22 pads are on NASM Main (Du Sud Isle) along the starboard side of runway 14-32 and on top of the workshop over the Black Sheep hangar, and HT-28 pads are on top of buildings B and C. There is also a NASMCO pad by building A, also used for VIP and special duty (like NFDT or VIP transport). Landings on all pads follow patterns that stay clear from the runways and their approach and take off paths. Landing conventionally (rolling landing) is authorized on runway 32, taking off conventionally (rolling take off) is allowed on runway 14. Take off paths after a pad take off should stay clear of runway 14-32 under 30 meters ascending and clear of 18-36 at any altitude. Heading out after neutral ascent (zero collective and cyclic) or during forward/aft ascent follow the inverse landing approach path, staying clear of fixed wing approach and take off paths. Use of the visitors pad (Pad 07) is allowed only in transit - never leave an unattended helo on Pad 07. Rotary wing operational deck varies, but Navy rotors observe a cruise deck around 150 to 200 meters ASL (130 to 180 meters AGL). Lower decks allowed depending on the mission. Refer to particular mission specs for details. Always use #11 NASM for Navy ATC. Remember that Du Sud Isle, where NAS Miramar sits, is a Homestead, so unless you are stopping for a very short time, please take your aircraft into inventory and rez moments before take off in the East Apron. Prim reserve should be around 300 prims at any time.